Full itinerary and activity options for Lares lodge to logde route high above Peru's Sacred Valley. Arrive in Cuzco in the mid-morning. A walking tour orients you in this legendary city of stone and sky. Visit the Plaza de Armas and cathedral before making your way to the Temple of the Sun and the Inca Museum. A morning visit to San Pedro market starts the preparation for your cooking class in which you’ll learn about Peru's rich culinary heritage and try your hand at crafting local flavors. You'll then enjoy the fruits of your labor at lunch. The afternoon is rich with impressive Incan archeological sites as you explore Tambomachay, Puca Pucara, Q'enqo and the imposing fortress of Sacsayhuaman. Tonight, you will learn more about your Lares activities at the guide briefing. 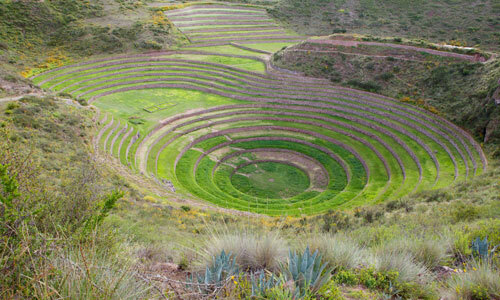 Cultural: Spend a little longer exploring Chinchero before continuing to the unusual ancient circular-terraced agricultural site of Moray. Visit the interesting Maras Salt Mines and have an easy walk to the village of Pichingoto. Moderate Hike: Enjoy a 5-mile guided hike downhill from Chinchero to the village of Urquillos, where you’ll meet your ride to Lamay Lodge for the evening. Today you have a choice of two optional morning activities, followed by a whole group cultural excursion. Cultural: Drive to the market town of Pisac. Tour the town and market and then continue by vehicle up to the village of Viacha. Moderate Hike: Drive to the town of Amaru for a 2.5- to 3-hour, 5-mile moderate hike to Viacha, crossing Challwaccasa Pass (alt. 14,200'). In Viacha, you will learn about artisanal potato farming practices, including some hands-on activities, and enjoy a traditional Pachamanca lunch, cooked under hot stones. Following lunch, a 40-minute easy and scenic downhill walk brings you to the nearby Pisac archeological complex for a tour of the site free from crowds. Return to Lamay Lodge by vehicle in time for dinner and a good night's sleep. Start with exploring the village of Lamay before continuing to the archeological site of Ancasmarca for a guided tour of these impressive and seldom-visited ruins. You'll continue to the town of Lares for lunch, after which you will have a choice of three activities. Cultural: Drive to the village of Choquecancha, known for its intricate weaving techniques and use of traditional dyes. Enjoy a guided tour of the ancient Incan ruins found in and around the village. After your visit, continue to Huacahuasi Lodge. Easy to Moderate Hike: Enjoy a 2- to 2.5- hour, 2-mile hike from Quelquena via Quelquena Pass (alt. 12,595') to Huacahuasi Lodge. Moderate Hike: Enjoy a 3.5- to 4- hour. 3.4-mile hike from the village of Cuncani via Cruzcasa pass (alt. 13,838') to Huacahuasi Lodge. Your stop for the night is Huacahuasi Lodge (alt. 12,585'), created and operated in joint venture with the local community to protect the cultural heritage and environment of the region. Today is an all-day outing and you have a choice of three activities. You return to Huacahuasi Lodge for overnight. Cultural: Visit the local community of Huacahuasi and join villagers in their homes to learn about village life and local traditions. Return to the lodge for a cooking class and lunch. Enjoy the balance of the afternoon at your leisure. Easy Hike: Enjoy an easy walk to a nearby waterfall. Return to the lodge for lunch, with the balance of the afternoon at your leisure. Moderately Strenuous Hike: Drive to the village of Quiswarani and enjoy a 5.4-mile hike via Huchuyccasa Pass (alt. 14,505') and Phoñoccasa Pass (alt. 14,475') down to Qeywaqocha Lake for a picnic lunch. Continue hiking down to the village of Quelquena for the drive back to the lodge. Following breakfast, you will have a choice of three all-day activities. Cultural: Drive to the Sacred Valley. Visit the market in Calca and nearby Museo Inkariy. Lunch at a local restaurant, then drive to Ollantaytambo to explore the town. For a small fee, enjoy a guided bicycle ride along the Urubamba River and visit the region's award-winning craft brewery. Easy Hike: Drive to the Lares Pass (alt. 12,896') for an easy, 4-mile hike down to the town of Totora. Drive into the Sacred Valley for lunch then explore the valley or enjoy an optional bike ride along the Urubamba river for a small fee. Challenging Hike: Depart the lodge on foot for a challenging, 8-mile hike via Ipsaycocha Pass (alt. 14,646') and then down to Ipsaycocha Lake for a picnic lunch before continuing down to Patacancha village. Drive to Kuychi Rumi Lodge for overnight. Enjoy a guided tour of the archeological site of Ollantaytambo. You may have some free time to explore the town and market before your mid-day rail journey to Machu Picchu Pueblo. After arriving in the afternoon, the rest of your day is free to explore the town and hotel gardens. An early start gets you up the winding road to the magnificent Machu Picchu archeological site. You'll have a guided tour of the Inca citadel before choosing between two activity options. Free time to explore the ruins on your own, possibly including a walk up to the Sun Gate. A guided hike up Huayna Picchu peak from where you will enjoy amazing views of the sanctuary below. Enjoy lunch at Sanctuary Lodge at the ruins, then return to the site for to explore on your own. You're free to take the bus back down the hill to your hotel at your leisure or stay at the site until closing. Your morning journey back to Cusco will deliver you in time for lunch at one of Cusco's popular restaurants and to enjoy some last-minute shopping. You will be transferred back to the Cusco airport in time for your late afternoon outbound flight.